Takeaway: These strategies will help you show executives that safety initiatives are in the company's best interests. Successful OHS programs have enormous payoffs. For those of us who know that, investing in them seems like a no-brainer. But it can be hard to get company leaders on board with safety initiatives – especially when the budget comes into play. It can take a bit of finesse, but it's not impossible to get buy-in from those at the top of the corporate ladder. Here are some tips to help you get executive backing for your safety initiatives. One of the best places to start is with research and statistics. Numbers often speak louder than words; use this to your advantage. According to the U.S. Department of Labor (DOL), the estimate business costs associated with occupational injuries stand at a staggering $170 billion. It's no surprise that these expenditures significantly reduce company profits. The DOL cites direct cost savings to businesses that reward health and safety policies, including lower workers' compensation insurance costs, reduced medical expenditures, lower expenses for return-to-work programs, and less money spent for overtime benefits. And those are just the direct costs. Meeting safety targets can also result in big reductions in indirect costs. Safety means increased productivity, higher morale, better relations between labor and management, and improved employee retention (see Connecting the Dots: Safety and Profitability to learn more). If you really want to convince your company's leadership that a comprehensive health and safety strategy is worthwhile, you'll need more than just a sketch on the back of a napkin. To win them over, you need to give them a good, clear sense of what you're looking to implement, what it will take to get it up and running, and what they can expect to gain from it (to get started, consider these 5 Metrics EHS Departments Should Be Tracking). No one wants to throw good money at a vague scheme, so make it as concrete as possible. Write everything out and put it in the right hands. Not only will this kind of document give executives a really solid idea of what they're asked to buy into, but it will give them time to read and review it before making a decision. Some things that get shot down after a quick presentation might just be embraced if there is time to really think it over. As a safety professional, you know that safety affects almost every aspect of the business. From corporate values and public relations to operation costs and productivity, there's almost nothing that can't be improved by great safety metrics and a solid safety culture. Unfortunately, executives can often forget that fact. Part of your job is to make sure that they don't. Executives manage many different parts of the business and have to wear different hats throughout a given day, but they can sometimes become so focused on the trees that they can't see the forest anymore. When they're too worried about production, cost efficiency, and the corporate brand to give safety the time of day, you have to keep on message and remind them that safety doesn't compete with those outcomes; it enhances them. They might complain that you sound like a broken record, but at least they won't forget the tune you're playing. "In the more traditional mode of leadership, known as transactional leadership, a leader will focus on the task at hand or the output of that task, whether it is a product or service. While your employees might work hard, they will be less invested in your organization and product if they feel you only care about their work. With transformational leadership, a leader will focus on not just the task, but also the person doing the task. This style of leadership shows that you, as a leader, truly respect and value the people in your organization, which in turn will inspire not just hard work, but also excellence and dedication from your employees." Good leaders, in other words, don't just care about their employees – they demonstrate that care. But, if this is all about executive behavior, how can it be of any help to you? It's true, you can't force executives to change their leadership styles – but you can exert a positive influence on them. Most company leaders will agree that they care about their employees and value their workers. They're also willing to take steps to show that care. So, it's important not to make your entire case for safety all about the numbers. Stats are impressive and data can be very convincing, but they shouldn't be your only approach. Although it might seem that way when you try to squeeze a bit more money out of them to improve the safety program, executives have more on their mind than just dollars and cents. Use meetings and presentations as opportunities to play to those broader values. Remind corporate leaders that they care about their workers, and that ensuring their safety is one of the best ways to demonstrate it. If you're not having any luck going straight to the top, you might have to start doing more work on the ground. Even the most reluctant company leaders can't ignore a big enough groundswell. Creating that kind of movement might sound intimidating, but you don't have to go at it alone. Appoint some workers to take on safety positions. You could appoint a safety leader for every team, encourage participation on safety committees, or establish a safety mentorship program (for related reading, see Enhancing Safety Culture Through Mentorship Programs). However you do it, getting workers to take charge of their and their co-workers' safety will have a powerful effect on the culture in your workplace. Sometimes, the best way to get executive buy-in is to build a safety culture from the ground up. 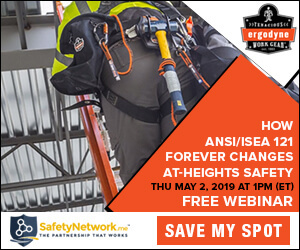 Don't treat this as a last resort – strengthening the safety culture and boosting employee engagement have lots of great benefits in and of themselves (see The Importance of Employee Engagement and Its Impact on Your Bottom Line to learn more). Chances are, you and the executives want the same things for the company. Your big disagreement is about how to achieve it and whether a strong safety program can play an important role in reach those goals. So, if you find yourself butting heads with them, try out these strategies and show them that a strong safety program is the solution they've been waiting for.